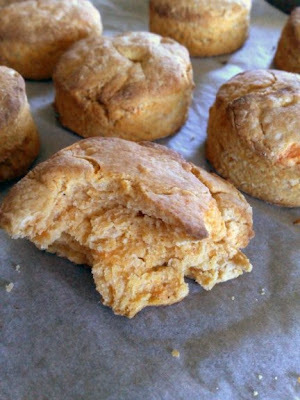 Erin of (one of my favourite blogs) Prudence Pennywise chose Dorie's Sweet Potato Biscuits this week and they definitely had me intrigued. Basically they are an American version of our Aussie classic, the pumpkin scone. Unfortunately I've never made a scone I've been totally happy with, and over the years I've tried dozens of different recipes! My other concern was using fresh sweet potato when recipe specified canned. I know Dorie said just use 1 cup of fresh mash, but that didn't seem to equate to 2 x 15 ounce cans. And I was right, because these were dry. Golden, flaky and great flavour but like I said, DRY. I knew at the time the mix was too crumbly. It did cross my mind to add some extra moisture but I second guessed myself and we ended up with hockey pucks. Boo. No time for a redo this week but I would love to have another go sometime. After last month I feel like I've conquered my fear of pastry, maybe now I will work on perfecting the scone! And now for something totally off topic but my sweet Oscar is 6 months old today! Your scones look great. I didn't even read the part about a cup of mash - I just made a half batch and worked out that half of 15 ounces is roughly 425g or so, so I bought a potato that weighed that much - you can tell I am not a maths whiz! Oscar is just gorgeous - he will be a lady killer with those baby blues. Too bad these were dry, but it sounds like they have potential. At least yours were fluffy. And you've got that lovely chubby-cheeked boy to nibble on! why are scones so tricky? mine always seem to come out flat. 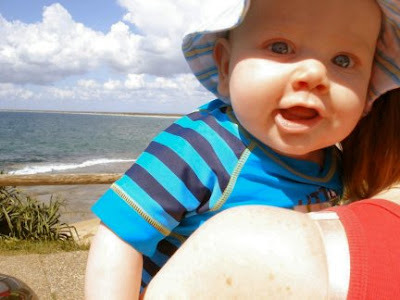 happy birthday to baby oscar--he's a cutie! Forget the biscuits! I want to bite those cheeks! Oscar is so adorable, and you are so blessed! So cute! And the biscuits look good too =D. Sorry about the biscuits but holy cow, what a cutie patutie!! Who needs fluffy biscuits when you have that darling face to look at. I think your biscuits look great. I had some hockey pucks too. I'm sure they will turn out better next go round...at least you made the dough from scratch I'm still terrified of this, but you might just have inspired me to try! Oh and Oscar is just too gorgeous!! Sorry these were dry. I didn't read the recipe right and totally messed it up, so your look WAY better than mine did! Biscuits look yummy!! Mine were flat and a little dry. Try, try, again. Love making scones. And they usually turn out. (Visit my blog for some decent recipes). hmmm...dry but good. These look great and so does your little guy.